Manchester louvered cupolas provide plenty of airflow while protecting the inside from nasty elements like rain, snow and even debris-carrying wind. These simple, effective cupolas are ideal for covering air intake vents, exhaust vents and fans; they can also be used as decorative elements on any rooftop. Because Manchester louvered cupolas are cost-effective and attractive, many of our customers cite them as their top choice. They’re available in several sizes, from a compact 18-inch by 22-inch model to an extra-large 84-inch by 113-inch model. These Manchester louvered cupolas can be painted to match your existing exterior surfaces so you can maintain a uniform look on your entire building. Our low price guarantee ensures you’re getting the most quality for your money, so working with us is the smart choice. A cupola and weathervane are the perfect complement to your shed or gazebo. We’ve taken the guess work out of it by combining the ‘right size’ weathervane and cupola for you. Our expertly crafted Manchester©® louvered cupola features timeless American style. The pure copper roof adds an architectural element of beauty. For a really distinctive finishing touch, it is paired with our pure copper Eagle Weathervane. For over 35 years Good Directions pure copper weathervanes have been unsurpassed in style, quality, and durability – perfect for the house-proud homeowner. 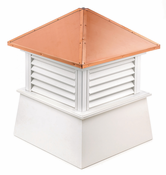 Both cupola and weathervane come with easy-to-follow installation and assembly instructions. The total height of the cupola and weathervane is 46"
Figure-only 21"L x 19"H x 16"Wingspan. For a really distinctive finishing touch, it is paired with our pure copper Victorian Arrow Weathervane. The total height of the cupola and weathervane is 44"
Figure-only 21"L x 17"H x 6"W.
A cupola and weathervane are the perfect complement to your gazebo or one-car garage. The total height of the cupola and weathervane is 56"
The total height of the cupola and weathervane is 54"
A cupola and weathervane are the perfect complement to your home or two-car garage. The total height of the cupola and weathervane is 68"
The total height of the cupola and weathervane is 73"
Figure-only 32"L x 24"H x 5"W.
It's the perfect complement to your shed or gazebo. Our expertly crafted Manchester® louvered cupola features timeless American style. It's made in the USA from durable white PVC-vinyl for many years of enjoyment. The polished copper roof adds an architectural element of beauty. Includes an easy-to-follow installation guide. For a really distinctive finishing touch, add a Good Directions weathervane or finial! Measures 18” W x 22” H. Builders rule of thumb: 1.5 inches of cupola width for every foot of unbroken roofline. Comes in three sections for easy installation and delivery. Square size measured at roofline. It's the perfect complement to your gazebo or one-car garage. Measures 22” W x 27” H. Builders rule of thumb: 1.5 inches of cupola width for every foot of unbroken roofline. It's the perfect complement to your home or two-car garage. Measures 26” W x 32” H. Builders rule of thumb: 1.5 inches of cupola width for every foot of unbroken roofline. Measures 30” W x 40” H. Builders rule of thumb: 1.5 inches of cupola width for every foot of unbroken roofline. Measures 36” W x 46” H. Builders rule of thumb: 1.5 inches of cupola width for every foot of unbroken roofline. It's the perfect complement to your larger home, garage, or barn. Measures 42” W x 54” H. Builders rule of thumb: 1.5 inches of cupola width for every foot of unbroken roofline. Measures 48” W x 64” H. Builders rule of thumb: 1.5 inches of cupola width for every foot of unbroken roofline. Measures 54” W x 72” H. Builders rule of thumb: 1.5 inches of cupola width for every foot of unbroken roofline. Measures 60” W x 80” H. Builders rule of thumb: 1.5 inches of cupola width for every foot of unbroken roofline. Measures 72” W x 93” H. Builders rule of thumb: 1.5 inches of cupola width for every foot of unbroken roofline. Measures 84” W x 105” H. Builders rule of thumb: 1.5 inches of cupola width for every foot of unbroken roofline.